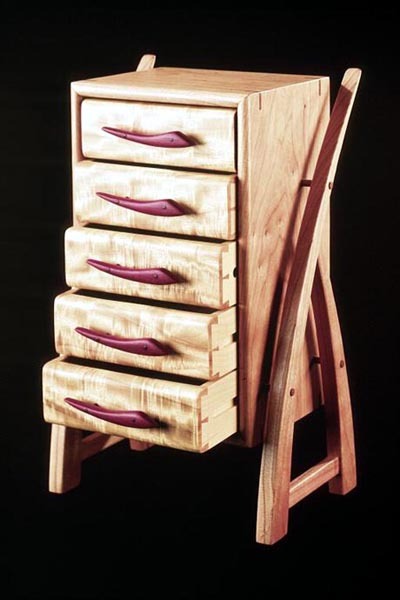 "Pisces" has 2" tall by 6" deep drawers fitted onto wood runners. I make the sides 5/16" thick and use a contrasting wood from the fronts. Pisces has Hard Maple drawer sides and Soft Maple runners. In 50 years...... the runners will wear and can be replaced easier than the drawer sides. I cut the runner slot with a 5/16" router bit set at about 0.160" deep. The runners, themselves, I make about 0.270" wide.... the 'extra' 0.040" or so that appears to be slop really is not.... the runners always contact the top of the drawer side slot..... gravity is a wonderful and repeatable thing..... so the difference between the slot width and runner width does not affect the fit at all.... but gives plenty of clearance in the vertical direction..... which you'll note is the direction the drawer sides will expand and contract over time. The side to side fit is more critical... I allow 0.020" per side for clearance.